Over the weekend The Hidden Garden had the pleasure of working with a crew of producers for a new show that will air on Lifetime Television. I know we can't really talk about the actual show, concept etc....but I thought we would show you a clip of how beautiful the ceremony site was. 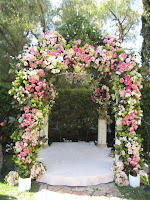 The chuppa structure was created with a flowing chiffon fabric and adorned with a rim of roses & hydrangea. Each floral tie back on the chairs was finished off with the flowing chiffon to compliment the chuppa design. The entrance of the aisle was adorned with simple vases of white hydrangea and Camellia leaf. Just goes to show you that sometimes simplicity can be very impactful! We had no idea what we were in for when Allie MacKay came to the shop at 5 am today, but we knew for sure it was be fun and full of surprises! Check out the footage here of our 3 segments. 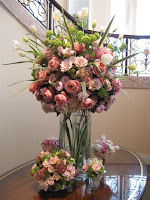 If you're interested in attending any of our 3 Mother's Day Floral Arranging Classes - call us at 310-575-6600. Thanks, Allie and KTLA! As we all know the Dr. Phil show is one of the most widely watched daytime shows out there! We were fortunate enough to be apart of his fantastic program. The show today was about a man that was afraid of getting married. He loved his significant other dearly but just afraid to take the leap of faith into marriage. Well today on the show....he took the leap and they were hitched! The Hidden Garden had the privilege of providing the bride with her beautiful bouquet! This past Saturday, we designed the flowers for the beautiful wedding of Marika & Greg at The Beverly Hills Hotel, coordinated by International Event Company. The ceremony took place in the Crystal Garden, and the reception for 300 guests followed in the Crystal Ballroom. Marika took advantage of the beautiful spring flowers, such as white lilac, celadon green viburnum, pink peonies and shades of pink toned garden roses. Here's some of "our" photos from the wedding. When we receive the professional photos from John Solano Photography we will be sure to share them with you! 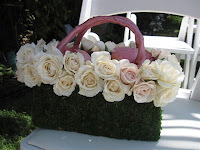 The Hidden Garden just started a new division of their company, floral design classes!! 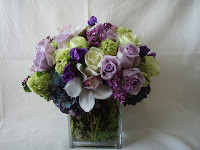 We have had so many requests from clients about the techniques we use in our floral designs. How did we pick those colors? How did we know what flowers to use? How do you cut the flowers so they all fit in the vase? The list of questions goes on and on..... We figured why not share a few tricks of the trade so you can have some fun with your own arrangements at home. We can offer group classes, One on One sessions, Group Gatherings for a special occasion and even a great Mother's Day Session with the little ones! 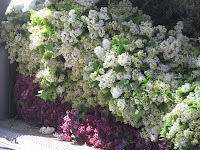 We took another trip out to Acton yesterday to pick up the most beautiful Lilac. Our cooler smells delicious and looks amazing! As you can see, celadon green is a very popular accent color. 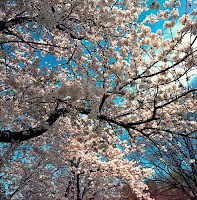 It is vibrant, fresh and screams "spring!" We just picked up fresh lilac today, straight from the farm!! It's so gorgeous and smells delicious. 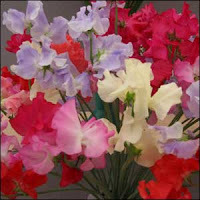 It will only be available for the next few weeks so give us a call at The Hidden Garden or order online. 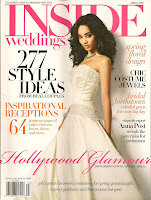 Take a look at my newest editorial in the Inside Weddings Spring magazine, "Wild About Spring". The magazine just hit the newsstands, lots of great stuff! Ranunculus (left) - a fluffy flower available in hot pink, light pink, white, yellow, orange, peach and some variegated options depending on the grower. Lilac (right)- (my favorite) the local grown lilac has a beautiful scent and comes in the deep purple, white and sometimes variegated tones. It's only here for a few weeks so enjoy it's short season!